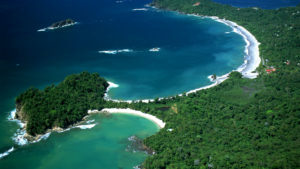 One of the protected wilderness areas is Manuel Antonio National Park, one of the most renowned in the world, with incredible white sand beaches surrounded by lush vegetation and wildlife this becomes one of the region's greatest attractions. 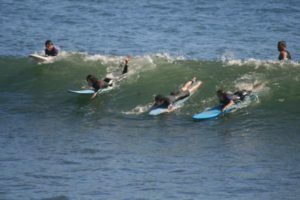 The ocean off the coast offers the best setting for a variety of water activities such as surfing, snorkeling, jet skiing, catamaran trips, sport fishing, scuba diving, whale watching and dolphins at certain times of the year. Quepos has a variety of restaurants, bars, hotels, art galleries and gift shops as well as a bustling and lively nightlife also the area of La Marina offers places to visit. In Manuel Antonio you can see the four types of monkeys, spider, howler, white face and squirrel monkey, the latter is in danger of extinction, The area is also an excellent destination for observing sloths, birds and different types of mammals Both inside and outside the national park.